“According to the sacred Mayan book of the Popol Vuh, Mayan man was created out of corn. Arisen from the yellow lushness of the mazorca, he is sustained by the hand of Bacab of the South, in the presence of the stars adorning the night of the white hand of Bacab of the North. The West, ‘Grave of the Sun’ and ‘Crib of Bad Winds,’ symbolizes war, animals of the night, hunger and death. Their Bacab is black. 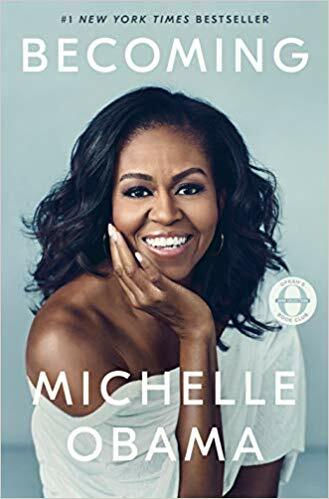 The Bacab of the East is red; out of which surge the fragrant rains of the great harvests that give life to man, and through him, to science and art. 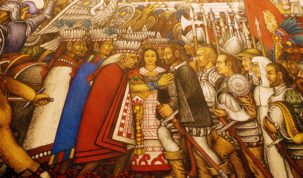 In this way, Fernando Castro Pacheco painted the eternal Mayan in 1971.” This information was gathered from the Records Registry at the Merida Government Hall. Here, the origin of the meaning of corn in the life of the Mayan communities is described. 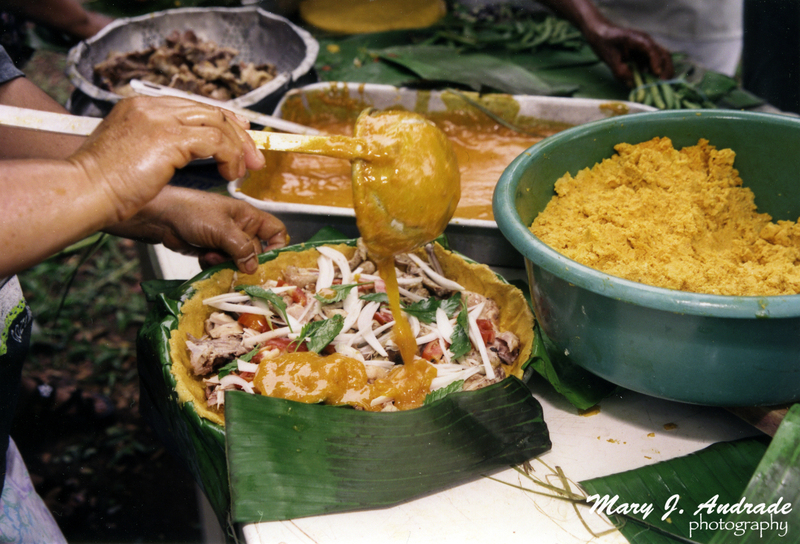 Anthropologist Miguel Angel Vergara defines the essence of the Mucbil chicken, a regional plate centerpiece of veneration and conviviality on the table of the altar. 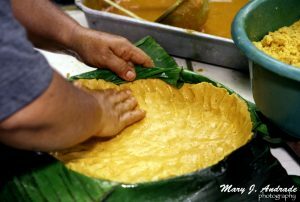 “What beautiful symbolism: imagine the tamal made from the dough of corn, with its meat of chicken or pork; with the achiote and wrapping of banana leaf cooked in a fire pit. 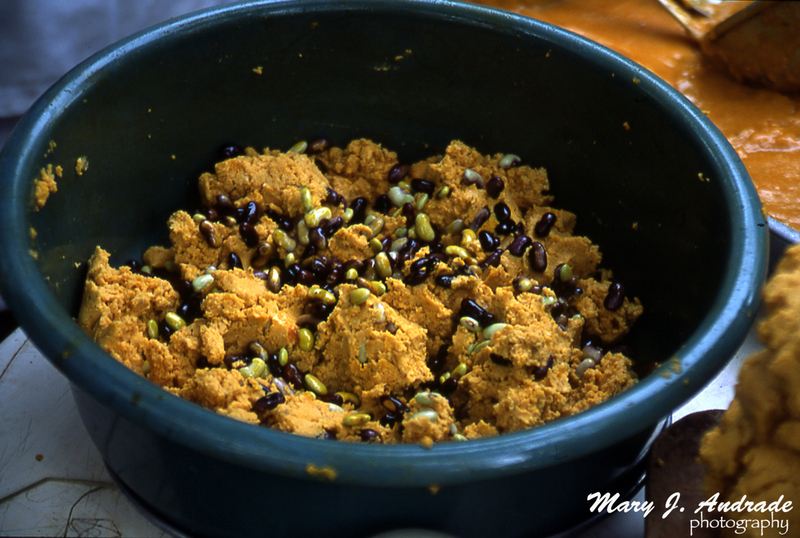 The substance, baked by Mother Earth is that essence of man transformed into its food. 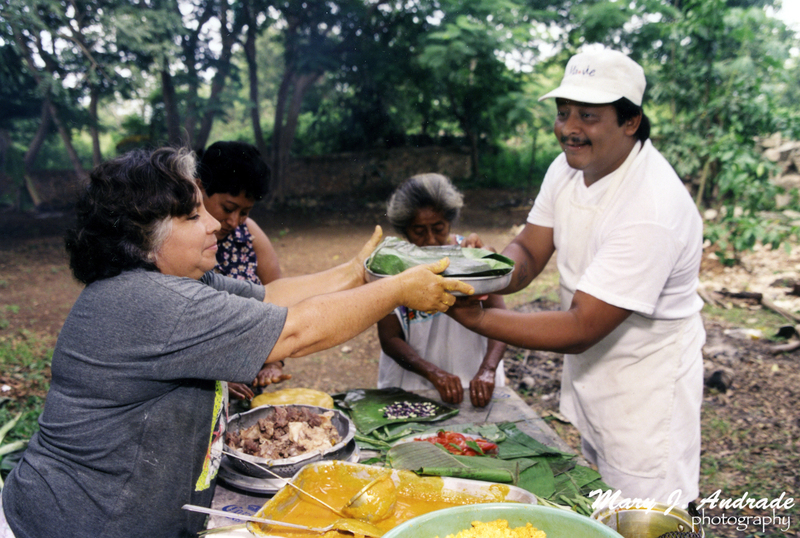 For that reason, the mucbil chicken is also transformed into food for the soul; that pib, that tamal, comes from the womb of Mother Earth to give man the opportunity to nourish his body and soul.” One commonly hears reference made to the “season of the pibes.” This is none other than the allusion to the sharing of food with the souls of the deceased and living relatives during Hanal Pixan, or Day of the Dead. It also refers to the preparation of mucbil chicken, a family activity, whose importance lies in that it is carried out together, establishing unity among family and neighbors. The labor commences days before the holiday. The corn must be taken off the cob. The espelon bean must be removed from the pod, an activity where young and old participate. Hanal Pixan is an occasion to share with the young that the grownups will not pass up easily, particularly the way of preparing the pib while sharing long-ago memories of past times. This oral communication is a way of maintaining tradition. 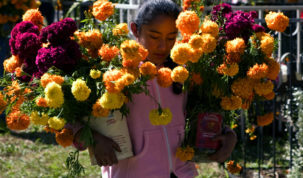 Before the sun rises on the first of November, women head to the market to purchase the necessary last minute ingredients. It is critical that the pibes be ready at about one o’clock in the afternoon. Also early on, they take the nixtamal to be ground up, and when it is time for it to be cooked, the older women who know how to prepare kol, the dough and the tortillas, direct the preparation of mucbil chicken. The chicken is boiled with oregano, garlic, pepper, a branch of epazote and onion until you get a concentrated broth. Take out all the pieces, for it is in the boiling broth that one adds the corn dough, diluting it so it gathers consistency. 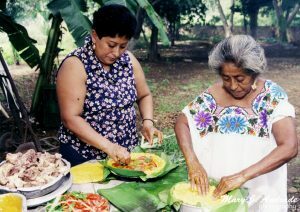 Subsequently, the achiote de arbol, pre-seasoned with lard and oil in equal parts is added so the pieces come out soft. This is what is called kol, one of the key ingredients in the seasoning of mucbil chicken. 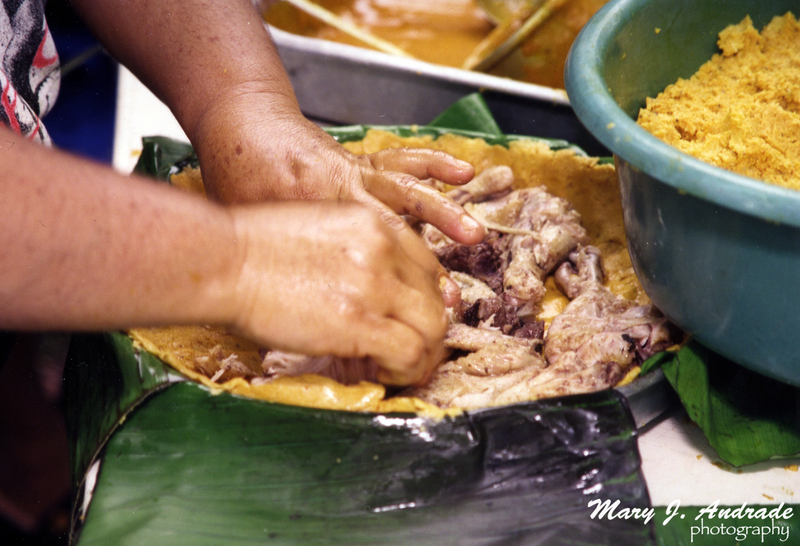 While the kol is prepared, others clean banana leaves with a piece of cloth after they have been toasted in the fire. 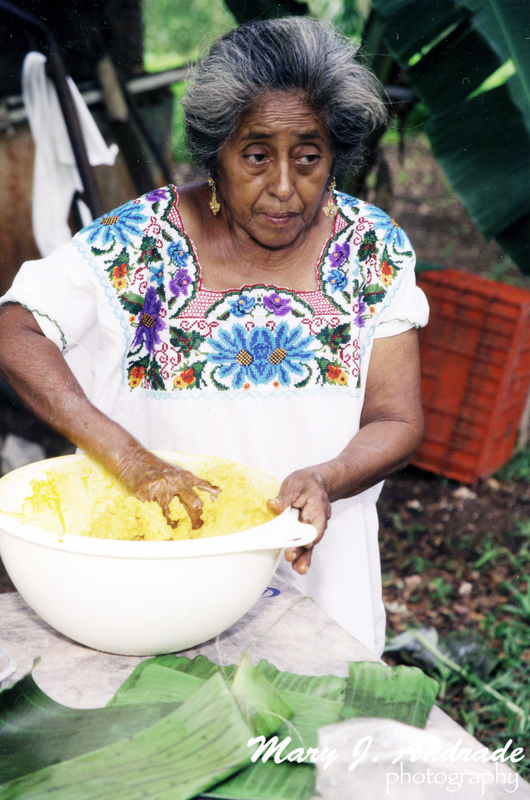 Some knead the dough and others make tortillas, still others fill a mold with chicken, pork, or simply with espelon. They add small slices of tomato, onion and epazote leaves covered with thick kol liquid. Then the same dough is used to cover it. 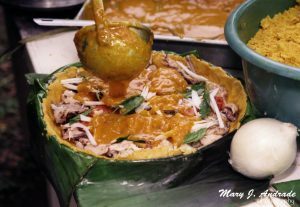 The filled mold is wrapped with a banana leaf and tied, then placed on a solid base so as not to become a problem placing it in or taking it out of the fire pit. In many communities the mucbil chicken is typically shaped in the form of a square, each corner pointing North, South, East, and West. 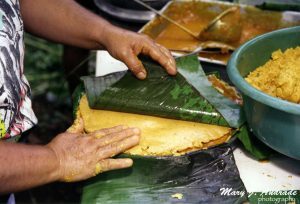 Another food that is prepared is the chachacuah, a baked tamale condimented with the same spices required in the mucbil chicken. The only variation is that the dough is a bit thinner. With great eagerness the men and children gather fire wood and stones of proper size for arranging on top of the lighted wood. The adults are in charged of choosing a high place in the house patio to make the pit. This is a task that obliges the men carry it out, as it involves heavy physical toil. wants to cook their pibes along with the person who made the ditch, they are permitted to do so with great pleasure, only all parties are certain to mark them appropriately so as not to confuse them with the others. Once the pibes have been set on the stones, young guava leaves are arranged over them. The pit is then covered with a shield and hefty henequen sacks known as pitas, and finally covered with dirt. 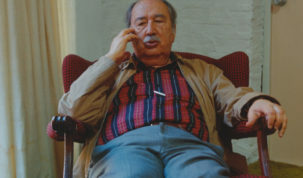 One must carefully mind the traditional knowledge and not allow the smoke to escape or the heat to flee; otherwise, they will not cook completely. It is said that whoever lacks the knowledge of mucbil pollo is called sis ka, which means cold hands. A thing that appears very simple has its particularities, and people should know how to do it. That is why the grownups are always the ones in charge of the task. 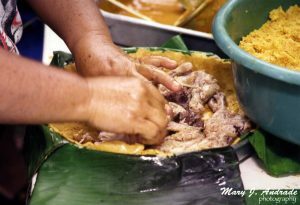 “To this we call tradition, when a group goes on teaching new generations how to do things,” comments Amilcar Ceh Cih, who gave us the privilege of seeing the preparation of pibes from beginning to end. Approximately two hours after burying the mucbil pollo the hefty henequen sacks and the shields are removed. The pibes are placed away with great care not to burn oneself, since the heat of flaming red stones in a ditch can reach extremely high temperatures. The first pibes are placed on an altar. The whole family recites a prayer and afterwards they enjoy this delicious dish, accompanied by drinks like chocolate, atole nuevo, posole, sacha (white water) made of corn, or balché.